Evidence regarding Pakistan’s education opportunities comes from none other than David Cameron, the Prime Minister of Great Britain. Following a recent visit to Pakistan, he laid the foundations for the initiation of this programme by highlighting the importance of education and Great Britain’s deep commitment, the Department of International Development (DFID), to support education sector reform and the promotion of a quality education for all school age children. 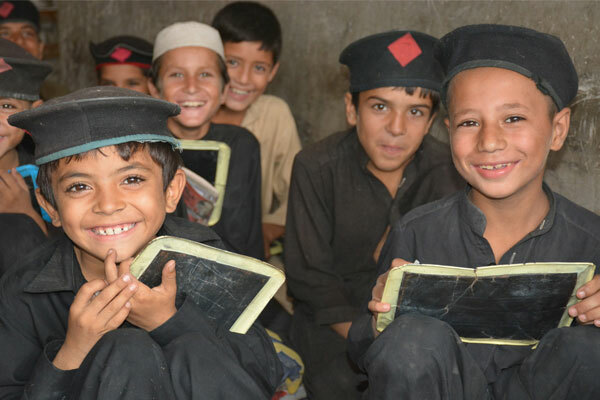 The size of DFID’s Education Programme in Pakistan is 800 Million Pounds, the single largest intervention in education ever made by the Department in the developing world. At the same time, following the Malala Yousufzai incident and more recently the APS terror attack, the international and national media has created a critical mass of awareness regarding the need for enabling and safe environments for school going children. In harmony with the World Education Forum 2015 for Equitable and Inclusive Education and lifelong Learning for all by 2030, call for free compulsory education is gaining fraction across the world. In response to the 2015 Oslo Summit’s reaffirmation of its commitment to education, Prime Minister Nawaz Sharif has pledged to double the allocation for education (from 2.5% to 5% of GDP) over the next three years. While national consensus remains elusive on many issues, the cause of education has emerged as a priority for all the political stakeholders. This commitment is reflected in the National Media, which has also taken up the cause of education and devoted funds, time and space for various public service campaigns to create awareness for the importance of education. "I strongly believe that education of youth is the only way forward for socio-economic progress of our future generations and that eradicating illiteracy is essential for promotion of peace, tolerance and harmony in any society"
All four provincial governments have raised their allocation for education in their 2015 Budgets. This demonstrates that following devolution, these governments have placed a high priority on the development of education institutions, in both urban and rural areas. Humqadam Programme, aligned with provincial priorities, strives, among other things, to create space and quality and bridge the gender gap. Around 70 percent of the programme funding is dedicated to girl schools. The best gift that any government can give to its children is education. the movement for better schools. A more inclusive education experience for all. Provision of new & improved classrooms for millions of children. Provision of washrooms, safe drinking water, electricity and boundary walls. Transformation of an estimated 250 Higher Secondary Schools to Model Institutions. Use of innovations to set new standards of quality in education infrastructure. they give back to society. The choice is ours. Why do schools need new infrastructure? Getting children into & keeping them in schools. To ensure a safe school environment. 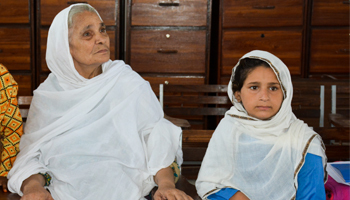 Pakistan is among those 25 countries lagging behind on the Millennium Development Goals. 25 million children are out of school. 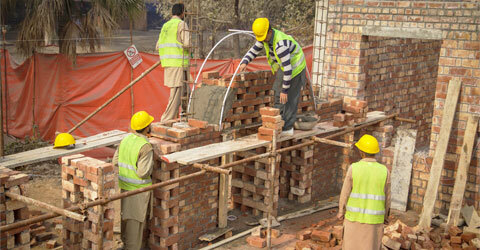 GBP 184 million allocated by DFID for School Construction & Rehabilitation Programme. Architecture students’ school design competition ongoing. Offices in Mardan, Charsadda, Peshawar, Lahore, Sialkot, Rahimyar Khan & Faisalabad established. 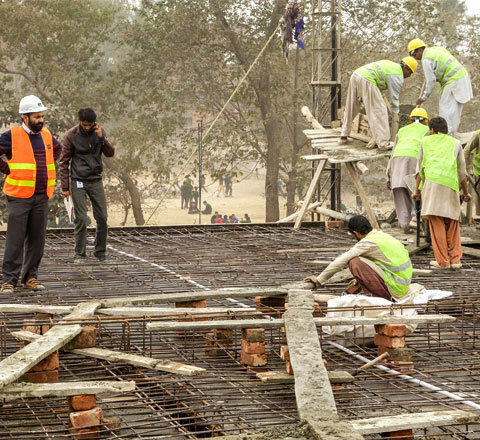 Construction work underway for 250 Higher Secondary Schools in KP & Punjab. 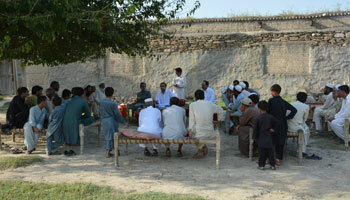 Community Committees for School Infrastructure (CCSIs) set up for 850 schools so far. Humqadam aims to create a more inclusive educational experience for government school going children in KPK & Punjab. 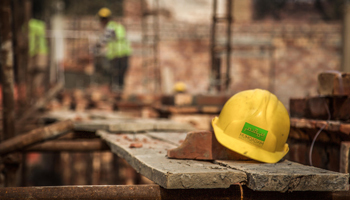 Humqadam’s core philosophy of school construction and rehabilitation is built on 5 pillars. These foundational principles reflect the needs of millions of Pakistan’s future stakeholders. So when the student asks to “Give Me 5”, this is what he or she means. I wish the INNOVATIONS seen in construction elsewhere can be brought to my school to make it a safe, secure and joyful learning place. The government schools in both provinces need to be upgraded in a way that creates improved educational environments, in line with 21st Century construction techniques. To this end, a variety of innovations are being applied by the Humqadam Team during the implementation process. These include, but are not limited to the use of Air Wells (for natural climate control), Flexible gypsum stud walls, Sandwich panel roofing, Horisontal leach pits, Precast Lintels, Chinese bonds/cavity walls and other concepts new to Pakistan. I hope that the QUALITY of my school is such that it has a long life and that I no longer have to fear floods and earthquakes. Humqadam is providing quality infrastructure with the holistic goal of improving the quality of education at the Primary School level. Our aim is to “build, maintain and sustain” in order to ensure the durability of the infrastructure and maintain a high level of comfort for students and their parents in terms of both functionality and safety. This quality is guaranteed not only through superior design but equally through a meticulous measure of attention to the building materials used in the construction of the schools. I want ACCESS to Education regardless of my gender, class, ethnicity or specially challenged condition. 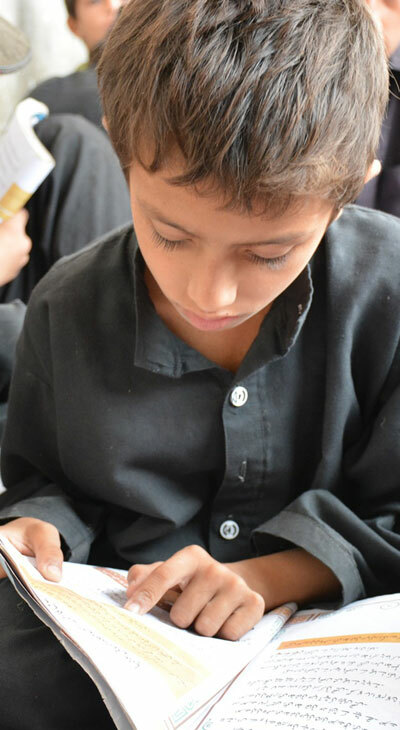 As part of the efforts to facilitate access to school for all children (with a special focus on girls), Humqadam is re-evaluating the requirements for educational infrastructure. Our shift towards bringing vulnerable and marginalised children back to school begins with the construction of improved infrastructure including ramps and toilets that accommodate students with special needs. Ensuring the provision of safe drinking water, sanitation and hygiene related facilities on premises is also a key factor in not just preventing children from getting sick but also giving their parents a sense of confidence in the school’s capacity to meet basic needs. It is my desire that my family and community take OWNERSHIP of my school so that they can take pride in my education there. It is a known, yet unimplemented fact, that there can be no meaningful development without community ownership of the education process. The Humqadam initiative is striving to widen participation through the active “enlistment, enrolment and engagement” of community members. At the present time, schools have their backs to the communities. In order to make this a more symbiotic and productive relationship, we are re-engaging with the existing school committees (PTCs & SCs) and nurturing new ones, such as the Community Committees for School Infrastructure (CCSI), which are charged to provide basic oversight during the construction process and beyond. The creation of channels, linkages and opportunities for these community groups will be a primary focus of the work that Humqadam’s School Support Teams (SST) will be conducting at the District level. I pray for the SUSTAINABILITY of my school so that not just I, but my younger brothers and sisters have the opportunity to share in my experience. 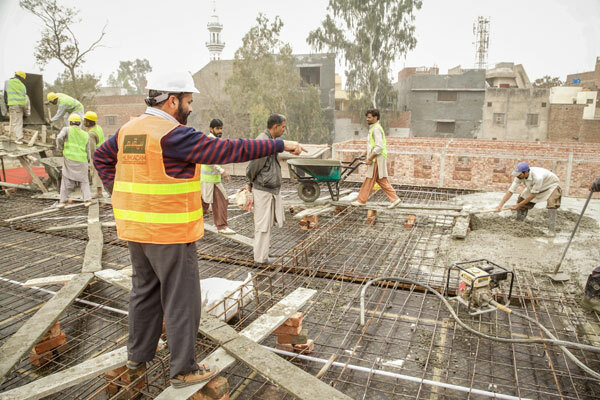 Humqadam endeavors to create the capacity for community ownership which is pivotal to ensuring that the traditional development failure of “building, neglecting and rebuilding” is not repeated. We believe that empowered communities are naturally more interested in school improvement and maintenance. This in turn creates the awareness that results in environmental concerns and ethics being brought to the forefront of school development plans. Humqadam’s emphasis on cross cutting themes (like WASH) is centered on the need to link schools to a large number of groups beyond the education sector. The long term objective is to create a legacy of stable and improved infrastructure for future generations. Community Development Coordinators (CDC) do social surveys and conduct Focus Group Discussions with local stakeholders to determine basic infrastructure needs. CDCs also engage the wider community by formulating and training Community Committees for School Infrastructure (CCSIs) to perform an oversight role of the construction process. "It is pivotal that the community takes ownership of their school to ensure its long term sustainability." Roger Bonner, Team Leader Humqadam. District Engineering teams visit the schools after the FGDs have taken place and do detailed technical surveys to pen down Statements of Requirements (SOR) for each school, bringing on board all the stakeholders including School Councils in Punjab and Parent Teacher Committees in Khyber Pakhtunkhwa, the Primary & Secondary Education Departments in the provinces. The SORs and basic layouts are then submitted to our Engineering Team at CPMU (Central Project Management Unit) in Islamabad. 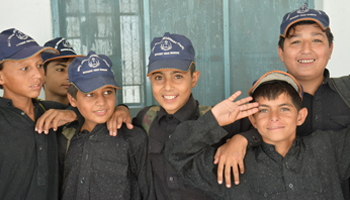 Unique plans which incorporate Humqadam’s innovative design principles are then put together for each individual school and once approved by the relevant parties passed onto the relevant implementing partners in the districts. A rigorous process for the selection of implementing partners (contractors, consultants and suppliers) is followed whereby they are first prequalified using a detailed evaluation criteria and based upon this, tenders are floated. Subsequently, our implementing partners are chosen and assigned clusters of schools in each geographical area. Quality and timeliness of work is ensured by the District School Support Team’s (SST) engineers who visit each and every school site periodically for this purpose and to make sure that payments to the contractors are expedited as the project milestones are accomplished. Throughout this process Humqadam’s Monitoring & Evaluation Team will be active and operating down to the district level, collecting data and aggregating it so that lessons may be learned and the processes may continually be improved to create greater efficiency, timeliness and value for money. 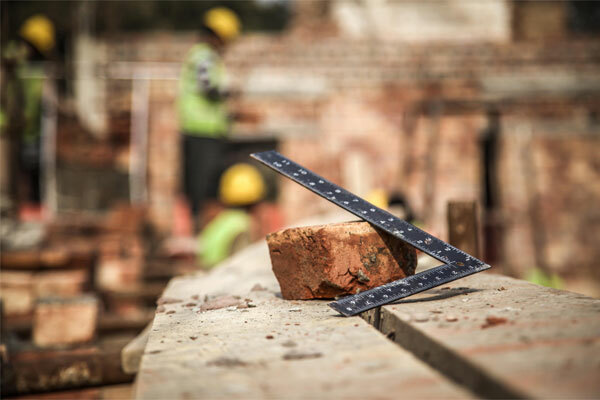 While maintaining a high quality of construction is key, sustainability can only really be achieved if local communities take ownership of their own schools. Such a mindset change lies at the heart of any meaningful effort to maintain new infrastructure and to ensure its longevity. To this end, the Community Development Team, consisting of 26 staff members, is reactivating Parent Teacher Committees in KP and School Councils in Punjab. Wider community involvement is also being sought through the formation of Community Committees for Infrastructure (CCSIs), which are meant to provide oversight during construction and to support the PTCs and SCs in maintaining the schools afterwards. This is an ongoing process and will continue long after our construction work is completed. 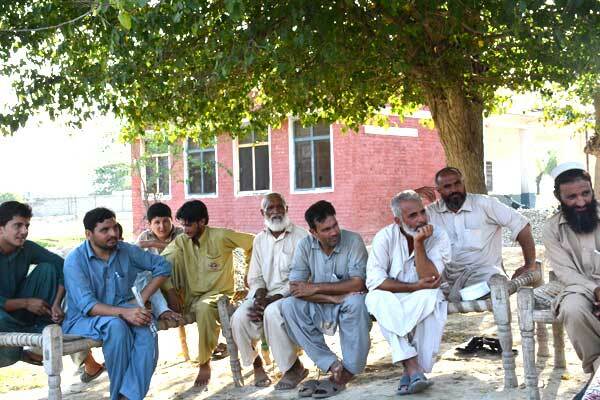 Capacity Building/Social Mobilisation: The Programme takes off simultaneously in the districts of Punjab. In the first year, SCRP will construct thousands of new rooms in the schools of Punjab & KP that urgently need space and improved learning environments. everyone that education is key.